Used to be that if the US military wanted to clear a roadway, runway or airfield of deadly IEDs (improvised explosive devices), they'd have to send in highly-trained and heavily armored explosive ordnance disposal (EOD) teams a la "The Hurt Locker." Problem is, this method is as ploddingly slow as it is dangerous to the servicemen and women involved. That's is why the Army and Air Force are teaming up to burn those IEDs clean out of the Earth using lasers mounted on MRAP battle trucks. The technology is called the Recovery of Airbase Denied by Ordinance (RADBO) and was developed through the U.S. Army Aviation and Missile Research Development and Engineering Center Prototype Integration Facility (AMRDEC PIF) at the Redstone Test Center in Huntsville, AL. 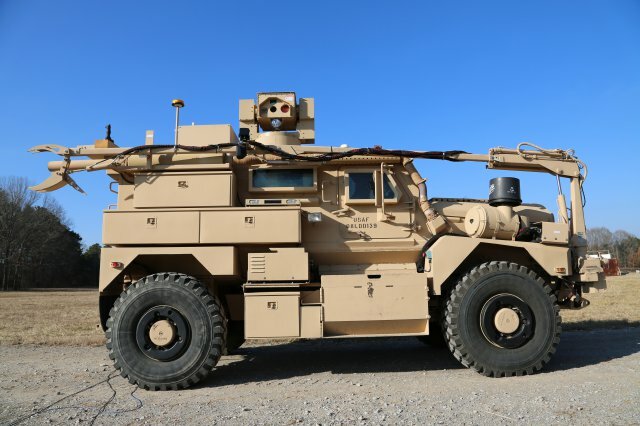 It mounts an Air Force-built laser (similar to what's used in the HEL-MD) and a dexterous manipulator arm onto the Army's Cougar I MRAP. That way, EOD crews won't even have to leave the comfort of the cab to disable roadside bombs. The laser can reportedly fry an IED from 300 meters away while the manipulator arm can rip up to 50 pounds of disabled bomb out of the ground at a time. "We may see hundreds to thousands of small unexploded ordnance items on a runway or airfield but the RADBO will allow us to reduce the time it takes to get an airfield operational," Marshall "Doc" Dutton, Air Force EOD modernization program manager of the Air Force Civil Engineer Center said in a statement. "Currently, if a runway gets hit it can take days to weeks to get cleared. With the RADBO, runways can be cleared and operational at a much quicker pace." The system is currently undergoing munitions testing before moving to Tyndall Air Force Base in September, though there's no word on when it will actually begin active service.